Acuity correction is an important step in modelling receiver vision, and in the QCPA framework, controlling for the receiver’s spatial acuity, and the viewing distance. This method uses a Gaussian convolution to eliminate spatial information from an image to simulate the spatial acuity of a given receiver. The principal is identical to AcuityView, however the processing methods are quite different. AcuityView uses fast Fourier transforms (FFT) to apply the modulation transfer function (i.e. blur the image), and these methods can only be applied to rectangular images. It is often necessary to measure specific (non-rectangular) parts of an image independently of their background (e.g. a butterfly in a museum case, where you don’t want to measure the background at all). Under these circumstances FFT-based methods, and even methods using standard “Gaussian filters” (such as those used by MATLAB, Photoshop and base ImageJ) are inappropriate because they use a more computationally efficient separable convolution function, which require rectangular image selections. We therefore wrote our own 2D Gaussian convolution function which can be applied to ROIs of any size and shape, to blur images appropriately independently of their backgrounds. The method is therefore less computationally efficient than alternatives, however the tools pre-scale the images to a suitable number of pixels per minimum-resolvable-angle (MRA) so that in practice this step is unlikely to take more than a few seconds for a typical image. 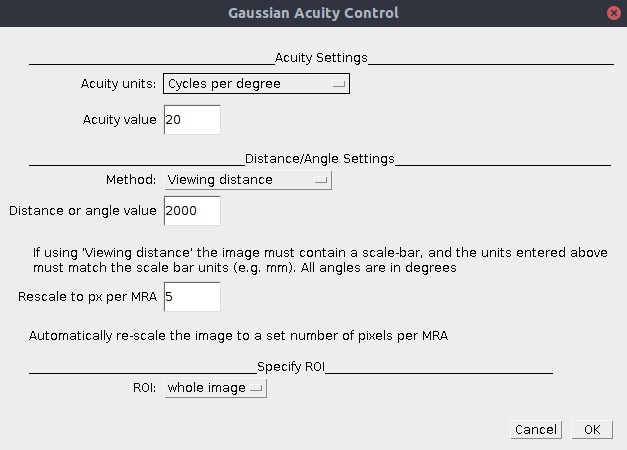 The Gaussian acuity control works on any 32-bit stack (e.g. normalised, linear reflectance image, or cone-catch image). You must also know the spatial acuity of the visual system you’re modelling (see the tables of acuity values here), and the angular width of the image or the simulated viewing distance (in which case you also need a scale bar in the image). Ensure the correct image is selected. You can either run this on its own (plugins > micaToolbox > QCPA > Gaussian Acuity Control), or as an option in the QCPA framework (plugins > micaToolbox > QCPA > Run QCPA Framework, and selecting “Gaussian Acuity Control” from the options). ROI This method can be applied to the entire image, or just a single ROI. Unlike almost all other methods for blurring images, this tool can blur ROIs completely independently of their surrounding pixels. Select the desired ROI to process here. A new image stack will be produced where each slice/channel in the input image has undergone the same level blurring and rescaling appropriate to the acuity of the selected visual system. Contrast at the spatial scale of the MRA will now be reduced to 2% of the original amplitude.